Does art heal? 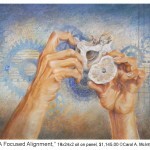 Does it facilitate healing for the viewer or the artist or both? 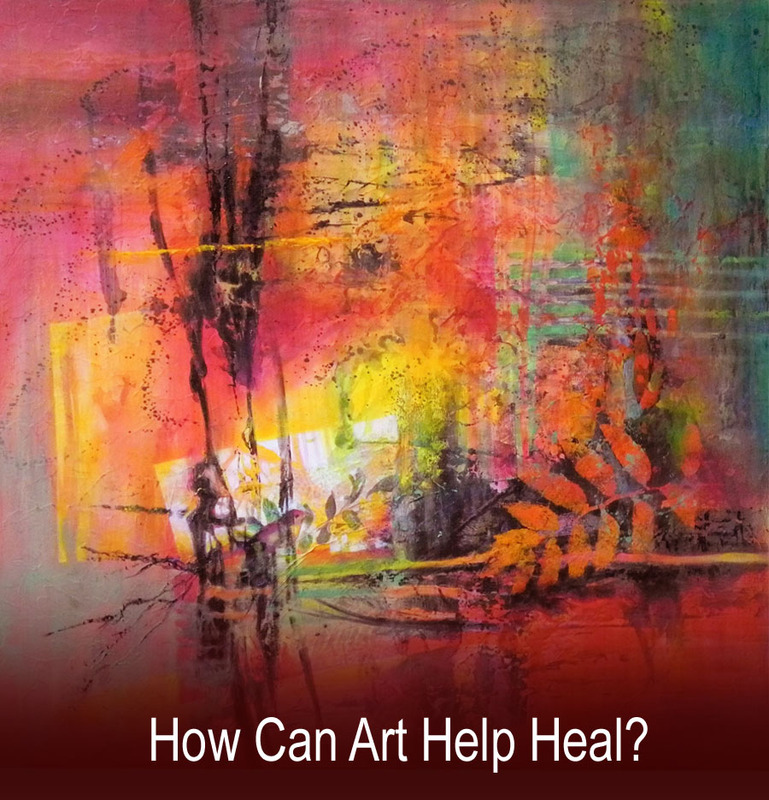 What do you consider the healing power of art? Is it something you think about as you create or as you view art? Or can you feel it? There is no question in my mind that art provides a valuable source for healing. I have heard many stories and witnessed how paintings have impacted lives. What is your experience? As a painter, I experience it often, sometimes with intent and other times it shows up unexpectedly. “Let the Caged Bird Sing,” a recent abstract painting, surprised me mid-way through the painting process with its emotional content and healing power. I am going to share my process as to how this transpired. As many of you may know, I begin a painting by choosing its color palette. Red is one of my favorite colors and since it had not been a dominate color for awhile, I chose it to be main color for this painting. 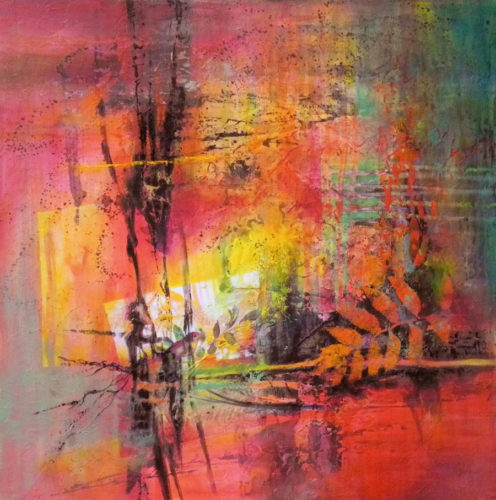 By the way, I had no intent for this abstract painting other than to make red my dominate color. At this stage, the painting wasn’t “speaking” to me, though I knew it would soon. I didn’t have any strong emotional connection to the painting, which was fine because I was enjoying the process and liking what was happening. I thought about stopping at this point because some artists would consider it finished but I didn’t. Meanwhile, turmoil was happening within my family as we dealt with my 44 year old alcoholic nephew. Other family members – a parent, uncle and sister – were venting their anger and failures at him. I was getting both angry and deeply saddened as I realized they have little compassion or love for him. They were also not owning up to their responsibility in the situation. Did I think this personal scenario would have an impact on my painting? It never occurred to me consciously, even while I added darker and more intense colors, as evident below. You can see the next couple stages of the painting process. As I continued to turn the board and search for its meaning and message, I stepped back and re-discovered the bird. I was quite surprised by what I saw. Suddenly tears started flowing as I realized how the bird was trapped. It became the symbol for my nephew. The more I painted, the more I could feel the contrast of love and anger — the symbols of red — begin to dissipate within me and I felt the possibility of shaking off the negative messages while seeking ways to help my nephew ‘sing.’ It took some challenging artistic problem solving to bring out the bird — to let it sing among the trees and the chaos. The healing power of art had manifested. One more surprise: when I went to varnish the finished painting (see below), I suddenly remembered that red is my nephew’s favorite color, which made me smile. I do love how the universe works. As a viewer, I do not expect you to see or understand the meaning of this painting. However, I do hope that you can feel the emotion, the passion and perhaps see something totally different from what I see. In fact, what do you see? This is one of the many reasons why I love to paint. Do you believe any healing took place while “Let the Caged Bird Sing,” was being painted? How have you experienced healing power of art? 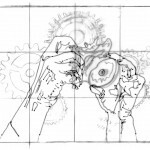 In addition to healing, what else does visual art bring to the world? 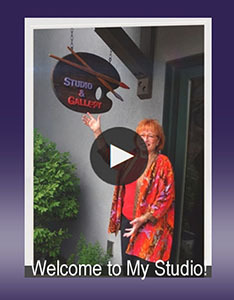 Thank you for sharing this authentic story about your creative process and the surprising emotional release your creative process brought you. Can ART heal? Absolutely! I read about the healing power of art, but I have not experienced this, because I don’t know how I begin this. It is very important to express our emotions, creativity through painting. It is known this is very good for our brain; relaxing, mindfulness. Unfortunately we have not a workshop with colors or painting class for adults in Romania. In my project, which I have in my mind to realize” A Successful Ageing”, I intent to make a group, to practice exercise for adults, and another group of painting or colors for adults, as a method to reduce the stress. For put in practice the plan for the 2nd group I need of basic knowledge to organize this course, and how we concept the lessons. Or maybe to attract a volunteer with art abilities. But it is necessary to know how we work with adults, what kind of lessons to have,what materials, to be efficient with this activity. If you can give me an advice, thank you. You are welcome Marie. Thank you for your comments. Mihaela, you are asking a complex question that I cannot answer with a simple answer. 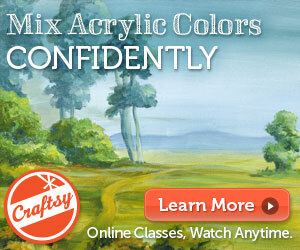 My color mixing class is available online via Craftsy. It is very affordable. 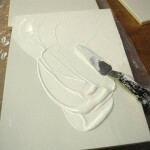 Here is the link: http://craftsy.me/2igakVk If you go through it, you can learn about the Two Primary palette that I use. I also have blog posts on this palette. Using only 6 colors with white is a great way to start. Many artists in the US are doing what you describe. Have you researched YouTube or Google for ideas? The biggest hurdle is to make people feel safe and comfortable with paint and a brush. Many fear it or think they will do something wrong. There are many ways to start this process but I am not an expert. If I think of something or a resource, I will let you know. Keep asking and you will find what you need. I wish I could be of more help.